By Pierre Frigon - Contributor · April 6th, 2019 at 2:45 p.m.
A solution for those who miss a sense of community around them. Climate change, shortage of land, lack of affordable housing, and increased rates of loneliness-- these are the problems that co-housing seeks to solve. This concept of housing aims to create integrated communities of residents through the use of open spaces, common areas, shared chores, community events and more. Co-housing is a concept that first originated in the 1960s by families that felt they lacked a sense of community in their lives. Modern housing has helped solve a lot of problems, but some feel it tends to divide us. Co-housing is a step into the past, reminiscent of when people had to rely on their community to thrive. To help form better communities, a big part of what makes co-housing unique is the required reliance on your neighbors. A schedule is created between residents for chores such as cooking dinner every night, or cleaning the common areas. This required trust is meant to bring people together due to the vulnerability of depending on others to cook your food or keep the community clean. Also, this system encourages residents to eat together at the same time in the common areas, therefore allowing relationships to build. Other benefits include the ability to carpool, a diverse community with people of all ages, access to community gardens, shared tools, but probably most importantly, people interested in being part of a community. Co-housing is relatively more popular in Europe in comparison to North America, but with a growing importance on sustainability and affordability of housing, co-housing has seen a rise in appeal. This interest is shared by UBC’s own Dr. Gord Lovegrove, a professor for the School of Engineering, and a handful of other students from the Engineering and Management faculties. Earlier this month, Dr. Lovegrove unveiled the Aviary, which is aimed to become Kelowna’s first co-housing project, starting with at least 25 units, with possible locations being Rutland, Glenmore and Mission. For those interested in this project, you can pay $250 to be part of the first stage of the Aviary, which involves being part of a 6-month process of relationship building, co-planning and more. 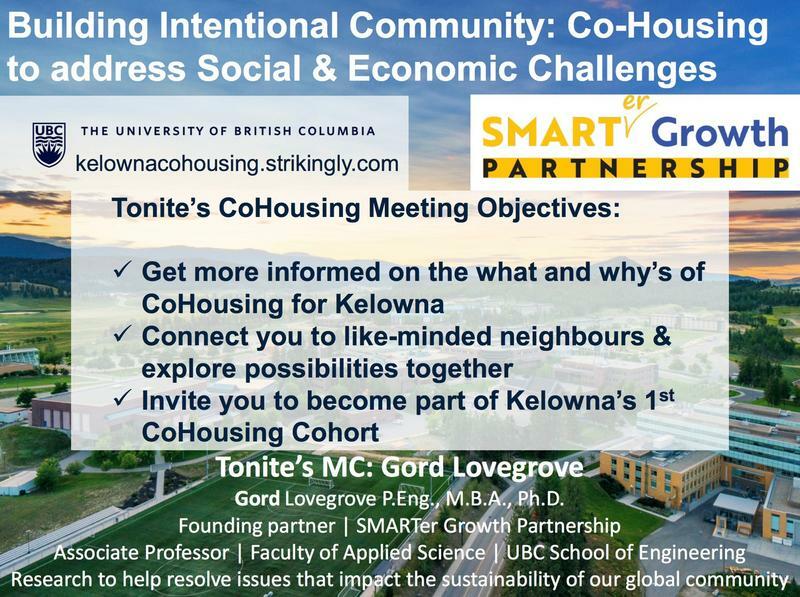 More information can be found at kelownacohousing.strikingly.com.